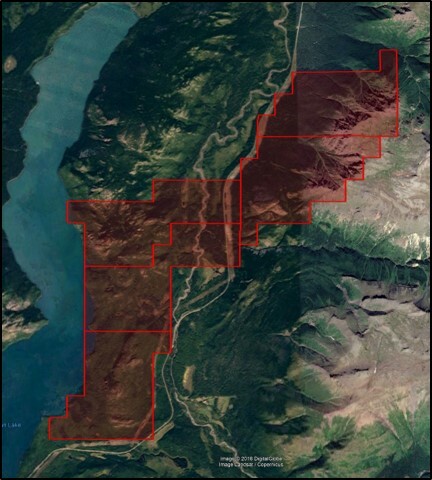 HAWKEYE owns a 100% interest in the 2,062 hectare Todagin Project (the “Property”) transected by Highway 37 and situated approximately 20 kilometres south of the Village of Iskut, BC, Canada. The Property is located east of Kanaskin Lake contiguous to the western boundary of the Red Chris Mine and the southeastern boundary of GT Gold. The Property occurs in the Stikinia Terrane within Triassic to Jurassic-age Stuhini and Hazelton Group volcanoclastic rocks and is located only 16 south of the recent GT Gold “Saddle” discovery where significant gold values were reported in soil sampling programs and the current drilling campaign. Mr. Greg Neeld, President & CEO states, “HAWKEYE is keen to grow its portfolio in the Golden Triangle of northwestern British Columbia. It provides HAWKEYE with properties covering more than 82 square kilometres in a significant mining district known for many producing mines (e.g., Red Chris, Snip, Johnny Mountain, Eskay Creek, Valley of the Kings), large advanced projects (e.g., GJ, Schaft Creek, Galore Creek, KSM) and recently, several exciting projects highlighted by GT Gold’s 2017 discoveries. We believe our second acquisition in the Golden Triangle will create further opportunity to create shareholder value through investment, exploration and discovery. HAWKEYE’s Todagin Project is situated in the northeastern corner of the Golden Triangle and positioned approximately 18 kilometres southwest of the Red Chris Cu-Au mine, 15 kilometres southwest of the North Rok occurrence, and 16 kilometres south of the Saddle discovery of GT Gold. 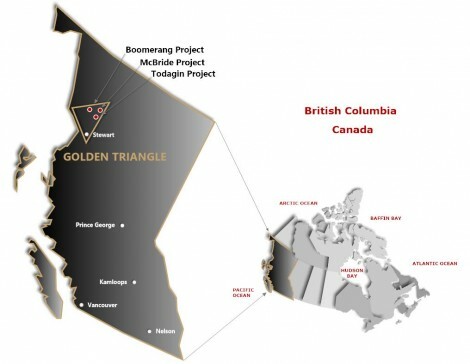 The Todagin claims are located contiguous with the Red Chris Mine property and large exploration properties held by GT Gold, and only 12 kilometres east of the Skeena Resources’ GJ project. 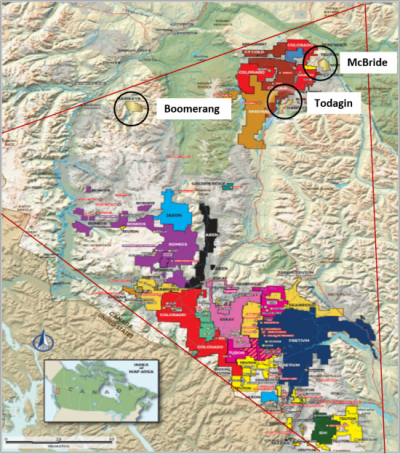 Similar to the property of GT Gold, the principal geological units in the region comprise the Hazelton Group and underlying Stuhini Group with precious and base metal mineralization commonly associated with structural controls within and adjacent to intrusions. The Jurassic-age Hazelton basalt, andesite, dacite and rhyolite flows and pyroclastics unconformably overlie Triassic Stuhini volcanics and volcanoclastic deposits. Both Stuhini and Hazelton lithologies are overlain to the south by Upper Jurassic Bowser subaerial to deep marine sediments. Monzonite, diorite to gabbro intrusions of Triassic to Late Jurassic age intrude the above packages. Carbonate, limonite, sericite, clay and silica alteration affect the volcanic lithologies. Previous fieldwork in the area included regional mapping and drainage geochemical surveys by government, and reconnaissance soil, stream silt and rock sampling programs by exploration companies focused on district scale Cu-Au porphyry targets. The results identified anomalous base and precious metals associated with weakly developed argillic, phyllic and propylitic alteration envelopes.